A few weeks ago I wrote a post on how to use an Arduino to control a DC motor’s speed and direction as part of an on-going project of building a WebRTC controlled webcam. This week we’re taking that same build to the next level by adding the ability to control last week’s build remotely, and in real-time, using WebRTC. This IOT project will consist of a client coded on Electron (previously atom shell), and a NodeJS server to handle communications with PubNub’s implementation of WebRTC tying it all together. By dragging a slider left or right on our client, we’ll send to the server the direction in which the motor should spin, and depending on how far from the center of the slider we go, it will determine the speed value we will send to the server as well. For our server to be able to communicate with the Arduino board we are going to need a NodeJS library which allows for such abstractions, luckily, there’s an npm package called Johnny-Five which does just that. To get started, as a proof of concept, I took the Arduino code I had originally used in Part I of this project and translated it into Johnny-Five. It’s worth noting that Johnny-Five’s abstraction deviates quite a bit from Arduino’s original API. Especially the way loops are treated. In Johnny-Five, loops are more like intervals in that they have a set time in milliseconds for each iteration, which is why I ended up using this tree-like wait structure. 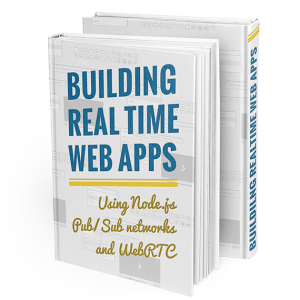 I have used PubNub’s implementation of WebRTC in a few projects before, including my Applying Effects to WebRTC Video in Real Time tutorial. Here’s a pretty neat interactive guide to package.json files.